Hola! It’s Thursday my friends, that’s one day closer to Friday and that’s good enough for me! 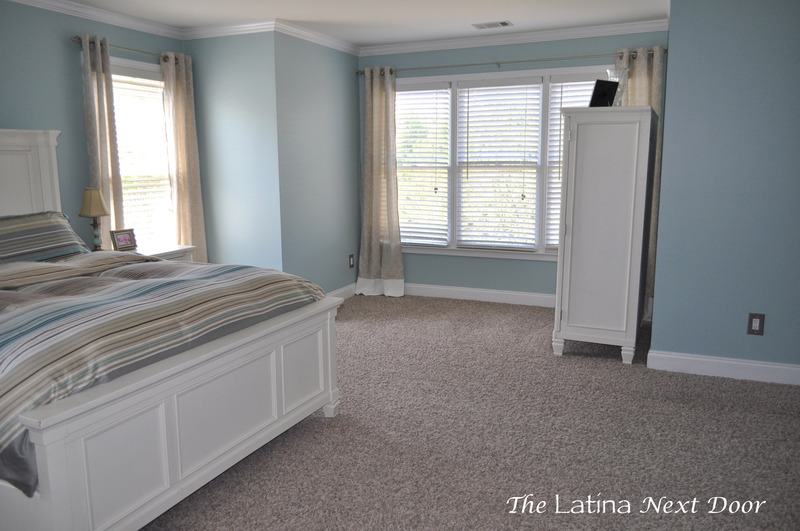 I wanted to share with you a bit of the progress in my master bedroom. Specifically, the seating area turned office nook. I actually have a dedicated “office” in the house, but right now it’s serving as a storage/craft room/play room/sewing room…. it’s just a hot mess. I still needed a place where I could pay bills, write my blog, shop online that would inspire a little creativity and give me a nice state of mind while doing so – a cozy office nook. I wanted it to blend in with the decor of the master bedroom so it didn’t look like an after-thought. I needed storage, but it couldn’t take too much space cause I didn’t have a lot of area to work with and I also didn’t want it taking away from the rest of the room. Most importantly, I had a small budget. The Desk is the Liatorp normally $299.00, but I scored it on Craigslist for $50.00!!! Can I get a hell yeah people?!?!? I thought the owners were crazy for selling it so cheap. But hey, one person’s crazy is another person’s SCORE! I’ll take it! 2. The mirror was from Kohl’s. They no longer seem to carry it. They have a smaller set of 3 here for $49.99. This large one was the same price, but you know I had that 30% off coupon making it $34.99 and I had at least $10.00 Kohl’s cash if I remember correctly. So grand total was $24.99 plus tax. 3. The chair is also from IKEA, the Henriksdal. This one I actually bought at the store. I used my IKEA family discount at the time they were running a sale so I got the chair and the slipcover for about $79.00. Psst…I have seen this sale happen more than once, so if you like this chair I would keep my eye out for it if I were you! 4. The pillow was another down feather cushion I bought from my local Goodwill store. It was $2.62. Once home, I washed and dried it and cut some fabric that I already had to make a cute little cover for it. The fabric I used up was approximately $5.00. 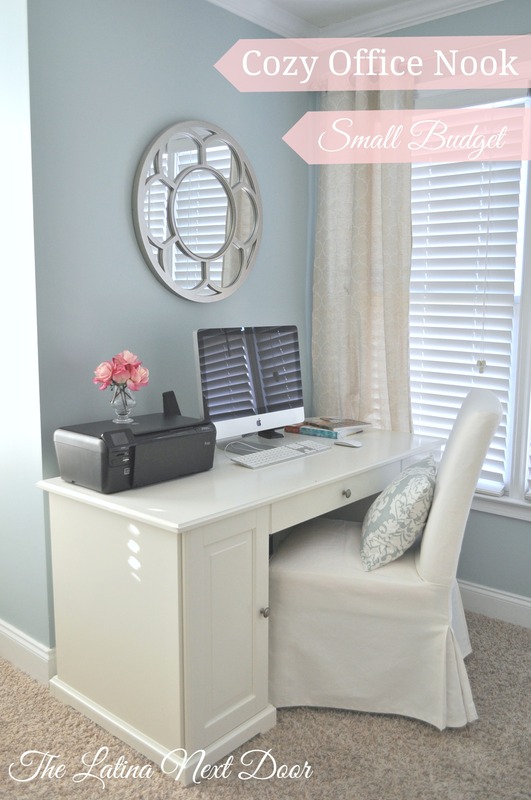 So the total for this cozy office nook came up to just under $162.00!!!! I am totally in love with how this little area has come along (patting myself on the back for those wonderful steals, specifically the desk). And just to refresh your memory, let us go down memory lane….Here is what it looked like when we first moved in. Then, here is after we painted, added curtains and our bedroom furniture. 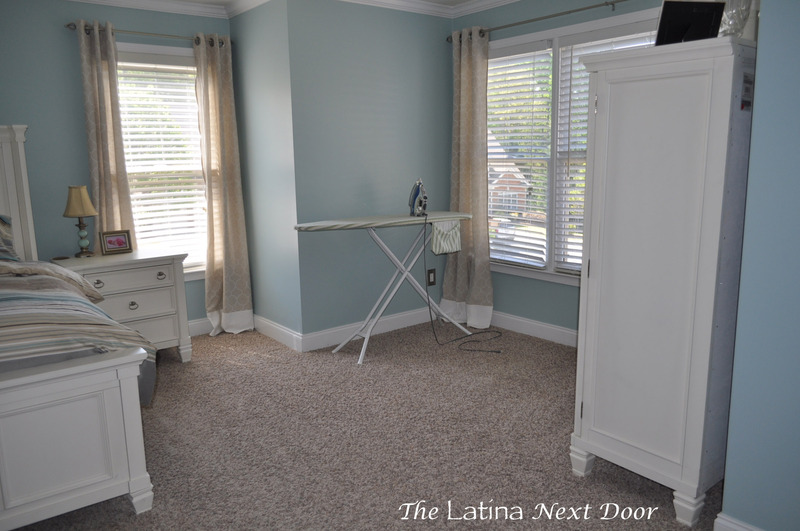 That armoire is pushed back up against the wall more now – that gap is just offensive! And here is what we used the nook for, for a little while. Just keepin’ it real folks! And now back to what it is today! It’s so purdy! So if you’re in need of a dedicated office area, but think right now it will cost too much, think again! You may have to be patient, but you will get it. 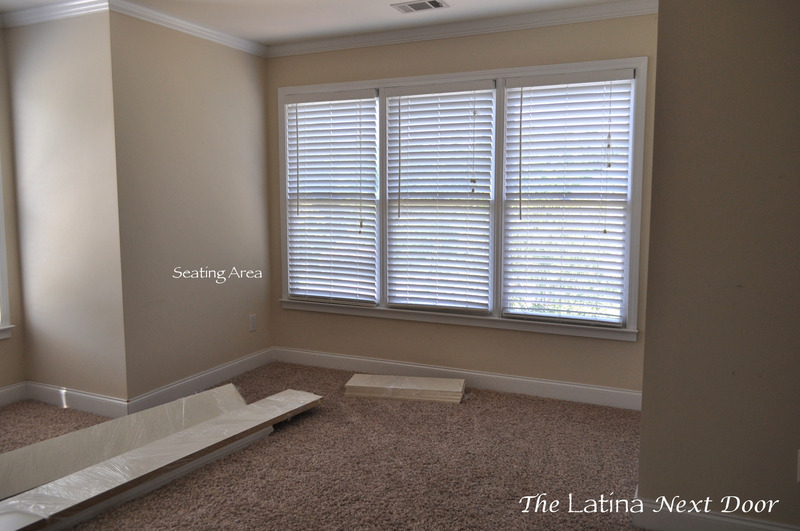 – First off, find the area that will work for you that way you know what size items you will need. – Then think about lighting, noise, atmosphere (meaning will it get you “in the zone”). – Also, realize you may have to do some work to get it the way you want in order to reduce your costs. In this case all I “DIY’d” was my cushion. I got lucky on the color of that desk! No painting this time. Whew! – Think about storage: do you need a lot or a little? This can reflect the final cost. But one thing to remember is DO NOT skimp out on style! This is YOUR office space and you need it to be inviting and inspirational. No matter what the budget. But think about it, if you really are on a SUPER TIGHT budget, you will need to get it close to right the first time, so you can avoid spending more money to get it right later… make sense? And finally, let’s be real peeps, I am no design guru, so if I can figure it out, I am sure you can to. Like this post? Check out more amazing projects like this at the Pretty Project Party over at Sarah’s Blog! Oh this is really cute! Now… how do I get rid of all the clutter to have such a nice little office nook?? It’s lovely, Yami! Thanks for linking up at the Pretty Project Party–pinned! AW! Thanks so much for the feedback and the Pin! It’s been a while since I have linked up, but I should be a regular once again!